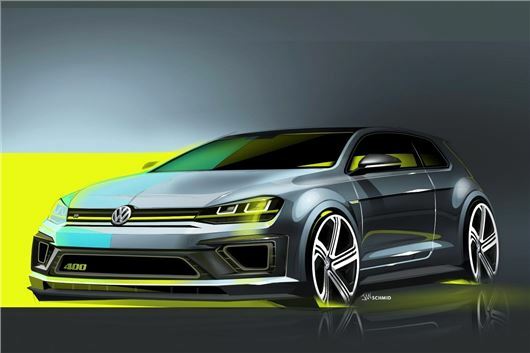 The Golf R 400 concept has been announced at the Beijing Motor Show. The 400PS Volkswagen develops 100PS more than the standard Golf R and can cover 0-62mph in 3.9 seconds. There’s no details about production, but it’s hoped that the WRC inspired Golf R could make it to market for 2015. The 400 is powered by the same 2.0-litre TSI petrol engine as the standard R, but features input from the WRC racing team. The engine' s maximum torque has been increased by 450Nm from 2400rpm - 6000rpm, while acceleration from 0-62mph has been lowered to 3.9 seconds. Top speed will be an incredible 173mph. The Golf’s four-wheel drive system has been improved to cope with the vast influx of power, which is distributed via a six-speed DSG gearbox. Volkswagen has sharpened the Golf R’s Haldex-5 couplings to reduce wheel spin and also added larger brakes. The exterior of Golf R 400 will be a modern interpretation of the legendary Rallye Golf G60, with a wider, fatter body and 19-inch wheels. The car’s black roof will be integrated into the rear spoiler and have two levels, which will give a split ‘flying’ design with an integrated LED brake light. The interior has also been extensively customised, with a carbon dashboard, lemon yellow trims. The driver and front passenger get leather racing seats with yellow R badges and six-point racing harnesses. The rear seats will also be leather.